An agile approach to updating Oracle. With PeopleSoft 9.2, Oracle has enhanced the upgrade landscape with its PUM (PeopleSoft Update Manager) approach. Users no longer have to wait for major releases to enjoy new functionality, fixes, and updates. The PUM approach is a shift away from large projects regular incremental gains that resemble a maintenance schedule. Organizations can install a single PUM image update, or bundle several images back-to-back. Single Update or Skip Ahead? Each PUM image Oracle releases is an opportunity for new functionality, updates, and fixes. Some releases are more important than others. An example of this is the July 28, 2017 release of PUM 23. PeopleSoft Update Image 23 will deliver a major product enhancement to expand the U.S. field TAX_CLASS from 1 to 3 characters in length. This enhancement will allow for additional U.S. Tax Class values to be more easily added in the future as they become necessary. What is the application impact with these changes? This field expansion affects several COBOL and SQR modules as well as online objects (fields, records, pages, etc. ), for delivered modifications in Update Image 23. These modifications are required as a result of the expansion of the field TAX_CLASS from 1 to 3 characters and do not constitute changed functionality. What should PeopleSoft 9.2 Payroll customers do? All Release 9.2 Payroll for North America customers will be expected to apply all Payroll for North America patches (and accompanying pre-requisites) delivered in Update Image 23. Selective or partial application of Payroll for North America patches from Update Image 23 is not an option. All product modifications related to the Tax Class field expansion are to be applied to your environment(s) before running the first payroll with a check date on or after January 1, 2018. Can PUM 23 be skipped? No. All subsequent Payroll for North America product modifications after Update Image 23 will enforce a pre-requisite to Update Image 23. Therefore, it is important all product modifications delivered in Update Image 23 be implemented when you apply Update Image 23. Which programs and objects are modified within the Tax Class expansion? An Excel spreadsheet (Preview_TCE_ModifiedObjects.xls) lists all of the Payroll for North America programs and objects being modified as part of the Tax Class expansion project. This list was delivered with Update Image 22 to assist customer planning for Update Image 23. This list is of value in situations where customers have customized any of the impacted programs or objects. Note: the spreadsheet does not list the new Payroll for North America objects, or the new and/or modified objects related to other products, being delivered in Update Image 23 within the Tax Class expansion project. What is the latest date PUM 23 can be applied? 12/31/17. Customers currently using Tax Class values 0 through 5 can continue to use these values for the remainder of 2017. However, customers are strongly advised to migrate to new customer-maintained Tax Class values after applying Update Image 23 and before running the first payroll with a check date on or after January 1, 2018. Customers are strongly advised to apply the Tax Update 17-C tax table scripts and other fixes as soon as they are made available as PRP special postings, rather than waiting for their subsequent delivery in Update Image 23. Once Update Image 23 is released, the PRP special postings will no longer be available to be applied individually. What other products are impacted by this change? Education & Government, U.S. Federal Payroll, Payroll Interface, Human Resources, Stock Administration, Compensation (Total Rewards), and Commitment Accounting. PUM 23 is an important release to incorporate into your PUM Strategy Planning. 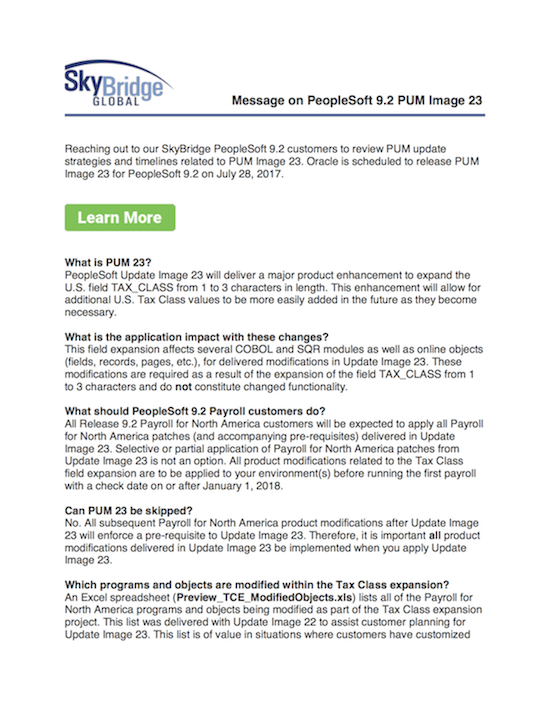 SkyBridge is recommending all PeopleSoft users be updated to 9.2 PUM 23 by the end of 2017, and PeopleTools 8.55.11 or above to support ElasticSearch by April of 2018. Highlights for HCM PUM 23.